On the Fourth Sunday of Lent, Fr. 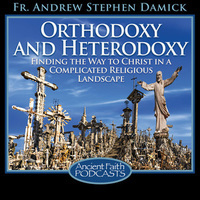 Andrew discusses the link St. Paul makes in Hebrews 6:18-20 between hope and the priesthood of Christ. On this feast day of St. Catherine of Alexandria, Fr. Andrew tells the true story of a love that is beyond our imagination. In this sermon, Fr. Andrew reminds us to obey all of the commandments of Christ.